From 15 December the large showcase will have the theme Longing to Spring. 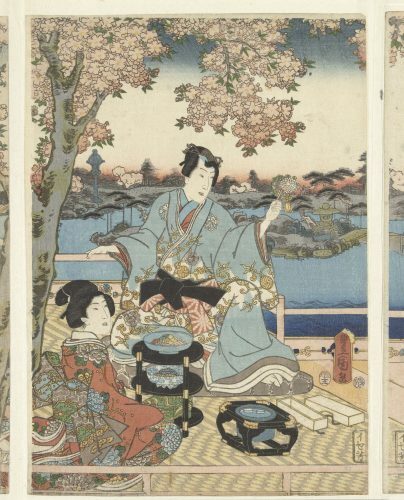 Four kimono’s and a screen, from the donations from Jan Dees and René van der Star will show the onset to spring, with plants that flower early in the season The pair of screens show a scene from The Story of Genji, in which a nobleman carries kimono’s over his shoulder amidst an abundance of cherry blossoms. This early twentieth-century work by Ogyu Jensen was donated this year by mr. Dees and mr. van der Star. Also, the Japanese works of art showcase will be redecorated and in the Korea showcase a selection of celadon wares will be exhibited.